Technically, my time with Radio Laurier is over… but I couldn’t resist jumping at the opportunity to review DAMN. by the one and only Kendrick Lamar. After the release of his acclaimed concept album To Pimp a Butterfly in 2015 and accompanying piece Untitled Unmastered in 2016, I was convinced that Kendrick would be on a break. Then, it happened. Out of nowhere, he dropped a track called, “The Heart Part 4,” which indicated that a new album was coming. It cited April 7, but I had to patiently wait until Good Friday, April 14. It really was a good Friday. Little did I know that DAMN. would become my favourite of Kendrick’s albums to date. It isn’t just a rap album. Each track offers something in terms of genre. Family matters come to the surface, which is reminiscent of 2012’s Good Kid M.A.A.D. City. The collaborations with Rihanna and U2 are somewhat unexpected, yet incredible. Kenny is fearless in his critiques on the government and the media, especially Fox News. He is the greatest rapper alive (sorry… still stuck on “The Heart Part 4”). 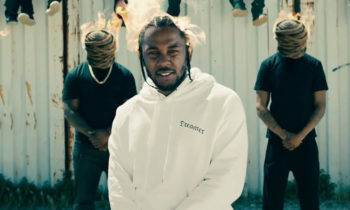 Kendrick has been acclaimed for his music videos, especially those coupled with tracks from To Pimp a Butterfly. I lost my mind when the video for “HUMBLE.” dropped, which is where the image at the very top of this post is from. If you haven’t seen it yet, click below. Just when I thought that my 2017 was made, the DAMN. tour was announced. Cornrow Kenny will be going on tour with Travis Scott and Big Baby D.R.A.M. Of course, my boyfriend and I got pre-sale tickets for his show in Toronto on July 25. I’m definitely going to be writing a concert review, so stay tuned for that. …but I love the whole thing.